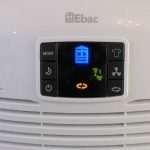 Ebac is a british company that designs and builds their dehumidifiers in the UK, and here we will be looking at one of their latest whole house dehumidifiers, the compressor based 21 litre Ebac 3850e. What are the headline features for this then? Well for me it is design, economy and capacity. 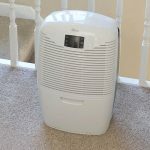 For a dehumidifier designed for a 5 bedroom property, with up to 5 persons this is big enough to handle almost any domestic job, but it still looks pleasant and consumes very little power indeed, read below. It also has a slightly smaller and cheaper brother, the 18 litre Ebac 3650e. The shape is pleasant to look at and the two tone design really helps to break up the size and shape, while adding a bit of style. The real bonus though is the ease of use. 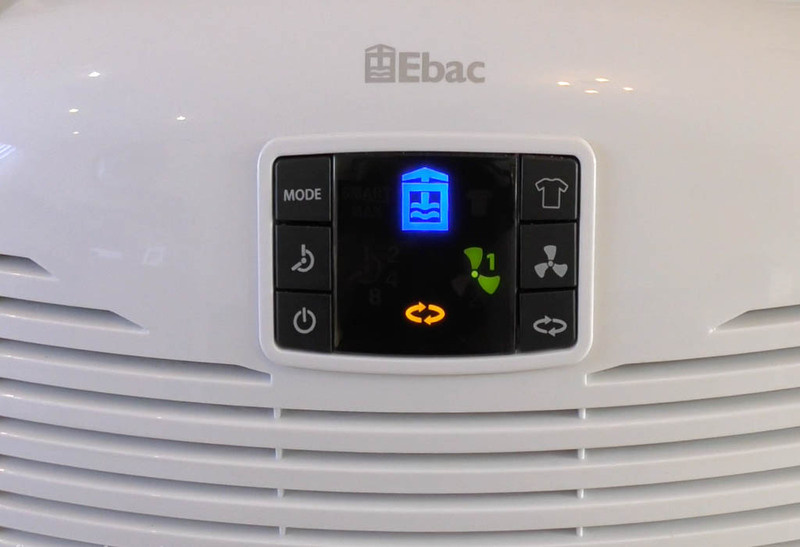 I have never used a dehumidifier that is so easy to understand and use. The LED display is clear and the icons are logical, more products should be this easy to use. Width : 32.5cm Height : 50.2cm Depth : 27.5cm. In weight terms it’s not light at 13kg’s, but this isn’t designed to be a portable unit, this is really meant to be placed in a spot to take care of business. However if you did need to move it about there is a handle hidden behind the air filter, and there are castor wheels available as an optional extra. Suitable for up to 5 bedroom homes with 5 occupants this will be more than enough for most users, the maximum stated water extraction comes in at a large 21 litres per day in ideal conditions. The water collection tank is more than adequate at 2.5L which is easy to remove, and for most homes will probably mean twice per day until any problem is under control. There’s also a continuous drain function if you require it. Power consumption is low, very low, and is amongst the best on the market at a measly 180w. Just like all the best dehumidifiers it has a humidistat to stop potential over drying of the air, this partners with the in built ‘smart control’ to maximize on energy saving whilst in operation. In noise terms it’s at par for the course at 46dB. So while it’s not the quietest unit I’ve ever heard, it’s not the loudest either, this isn’t one for placing in a bedroom with you, but then again it’s not designed to be. It does have a nice continuous tone with no pitch changes, so placed outside a bedroom or a landing it shouldn’t be a problem, and you can hear this in my video at 1m40s here. Update – Some users are reporting a rattle in the plastic case, usually around the clip on filter cover. Whilst apparently it can be fixed by jamming in a packer of some sort, I’m duty bound to mention known faults, but I have no way of knowing if this problem has been fixed in newer versions due to the sporadic nature. 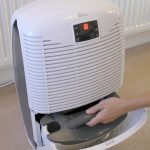 Because this is one of the newer more economical compressor based dehumidifier, it has an operating temperature range from as little as 10 to 35C making it very competent in most home environments. During two hour testing runs it brought down the humidity very quickly and extracted 370ml of water in the low speed test whilst lowering humidity from 68%RH to 54%. Test two started at 68%RH and lowered it once again to 54% and extracted 400ml (0.7 pints) of water. I think what happened is that the onboard humidistat kicked in to stop the overdrying of my house on both occasions, that’s why we see the same 54%RH figure and similar extraction amount. Overall I was quite impressed with the result for only 180w of power consumption. You can see my testing environment here if interested. The laundry function is more passive on this than some of the other units I’ve tested, dont expect a large amount of air, it’s a gentle waft at close range. Well it comes with a 2 year guarantee, UK customer care, and a 2.1 metre power cord with cable tidy. 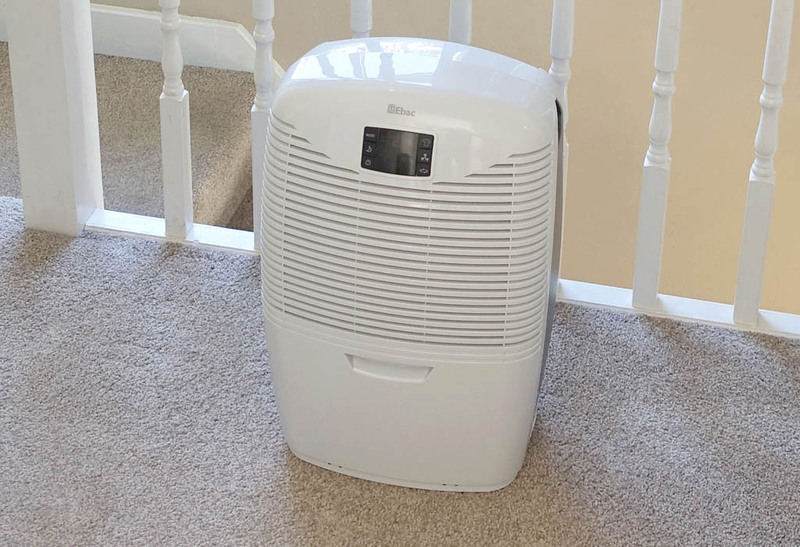 This isn’t really designed to dance around shouting about its features, it dehumidifies, does it well, and consumes the least power possible while doing it. I never waste my time reviewing poor dehumidifiers, especially if I’m going to the trouble of making a video about them, that would be stupid. So having seen one in the flesh before hand, and having done some research I knew it was a good unit. 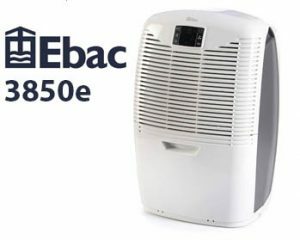 What I like about the Ebac 3850e is the simplicity and economy, simple as that.